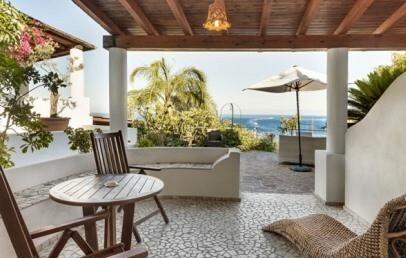 Villa Enrica Hotel is located in a hilly area of Lipari and is characterized by a peaceful and quiet atmosphere and affords a wonderful view of Marina Lunga bay and Lipari Castle. The hotel is only 1 km away from the old town and 2,5 km from the nearest beach. Renting a scooter (or alternatively a car) is the best way to visit the Island and discover all beaches and corners of the Island. How to reach the hotel: Fontanarossa Catania, Palermo Punta Raisi, Trapani and Reggio Calabria are the nearest airports to the Aeolian Islands. The Aeolian islands are connected to the mainland through the ports of Milazzo, Messina, Palermo and Naples. By Sea: The Aeolian Islands can be easily reached by hydrofoil or ferry from the port of Milazzo, Messina, Reggio Calabria, Palermo and Naples (www.siremar.it or www.libertylines.it). Milazzo is the nearest port and offers a departure every hour. Cars and motorbikes can be embark only from the port of Milazzo and Naples. The last departure time to Milazzo is at 21:00 by NGI. Naples is the closest port for those who come from North and Central Italy. From Naples during summer are 2 ferries per week and 1 hydrofoils daily. 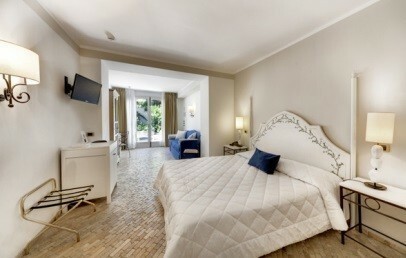 Surrounded by olive, almond and orange groves, the Villa Enrica is a 4 star Boutique Hotel, an elegant oasis of relax. It houses a total of 21 rooms and features a successful mix of local materials, ancient furniture and a touch of modern style. The outdoor area includes instead a beautiful and panoramic swimming pool with whirlpool, sunbathing area. During the months of July and August cars cannot move freely through the island without special authorization issued from the hotel. Customers who wish to use the car must indicate this at the time of booking in order to ask for permits. All rooms are spacious and decorated in warm colors. They have been restored from an old family villa so they are all different and unique. Each one provides en-suite bathroom (some with Jacuzzi shower or tub), terrace with partial sea or garden view, air conditioning, satellite TV, safety-box, hairdryer and minibar. Classic Garden View – double or twin room of 14/19 sq.m., located on the ground or first floor, bathroom with tub or shower, small terrace with garden view. 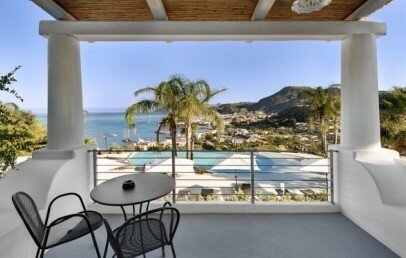 Classic Parital Sea View – 14/20 sq.m., located on the ground or first floor, bathroom with shower, small terrace. Deluxe Sea View – 20 sq.m., located on the first floor, bathroom with shower, small terrace. Junior Suite Sea View – 27 sq.m. 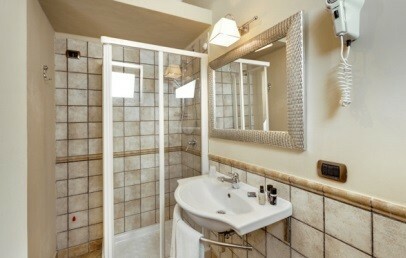 located on the first floor, bathroom with shower, living corner with sofa bed, equipped sun terrace. 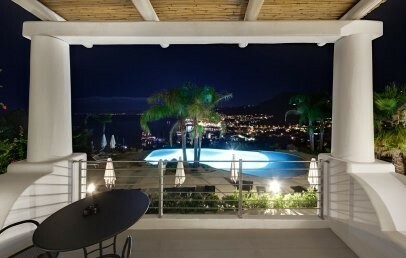 Villa Enrica Hotel has not a private beach and the nearest one is located at about 2,5 km away. Nevertheless the Hotel has some special agreements with some “Lidi” in the nearby with shuttle service included. Your stay at Villa Enrica includes a reach breakfast service while the half-board service includes the dinner at the nearby restaurant "Chimera", specialized in typical cuisine rigorously prepared with local products. The hotel offers a complimentary shuttle service to and from the restaurant. Light lunches (appetizers, salads, fresh fruit) can be provides at the Pool Bar only during the high season. The hotel offers following services: internet access Wi-Fi complimentary, the pool bar open from June to September; special agreements with a beach club (shuttle service included from May to September); external restaurant with special agreement (shuttle service included); scooter and bikes rental; excursions; laundry service and free car park (unattendant). Double or twin rooms located in the ground or first floor. They are comfortable and decorated in warm colors. 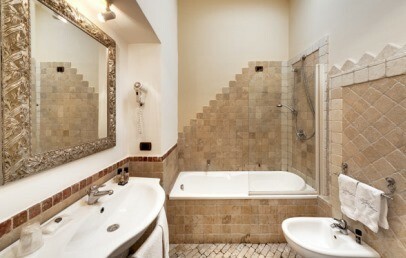 The en-suite bathroom provides shower or tub and hairdryer. 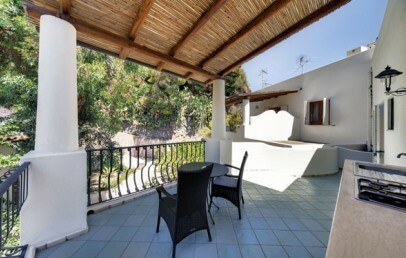 The rooms have a little terrace equipped with chairs and table and afford a garden view. Double or twin rooms located in the ground or first floor. They are comfortable and decorated in warm colors. The en-suite bathroom provides shower and hairdryer. The rooms have a little terrace equipped with chairs and table and have a partial sea view. The Deluxe Rooms are located on the first floor. They are comfortable and decorated in warm colors. The bathroom provides shower and hairdryer. The Deluxe rooms afford a beautiful sea view and have a small equipped terrace with loungers. The Junior Suite are located on the first floor. They are comfortable and decorated in warm colors and have a living area with a sofa bed. The bathroom provides shower and hairdryer. 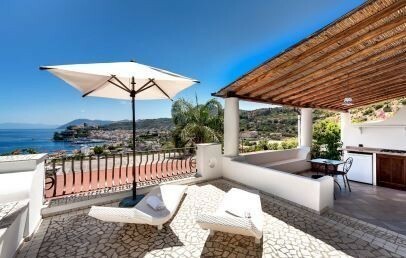 They offer a beautiful view over the sea and have an equipped terrace with loungers. 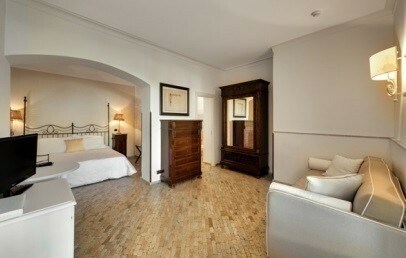 The Junior Suite can accommodate up to 4 people.